Over the years I’ve read a lot of books about investing and value investing in particular. Out of all those books, only a handful had a major impact on how I invest. In fact, that handful of investment books has probably helped me to generated excess profits of more than a thousand times their combined cover price, which certainly sounds like a good investment to me. So in this blog post I summarise 39 of the most important things I learned from three books that had the greatest impact on how I invest. This is the book that launched my move from Ben Graham-style deep value investing (buying micro-cap companies for less than the scrap value of their tangible assets) to Buffett-style defensive value investing (buying consistently successful dividend-paying companies at attractive prices). I read it in 2010 at a time when I was getting fed up losing money on turnaround situations that never turned. The book had almost everything I wanted and even today it forms the kernel of my strategy. 1) Most investors are driven by today’s news rather than the long-term expected performance of the companies they own (I already knew this when I read the book, but it’s still an important lesson). 2) Good companies with long track records of success are much more likely to turn around than weak companies with histories of so-so results (this is important because value investing often involves buying companies that are turning around to some degree). 3) Good companies are ones that have some sort of low-cost durable competitive advantage so they don’t have to compete primarily on price. 4) The best low-cost durable competitive advantages are based around well-known brand names combined with products or services that customers need to purchase repeatedly, preferably more than once each year (e.g. Colgate, Nurofen, Coca-Cola, Google). 5) As with all forms of value investing, buying shares at attractively low prices is critical. This means that bear markets are good and bull markets are bad. It also means the best time to buy good companies is when they’re facing (preferably minor) problems and are out of favour with other investors. 6) When analysing a company, look at the financial results for the last ten years. 7) Good companies have consistently high rates of profitability because they can either charge a higher price for their goods/services or they can provide the same goods/services at lower cost (according to the book Buffett uses return on shareholder equity and return on total assets to measure profitability). 8) Good companies have steady earnings which increase over time. 9) Good companies have low levels of long-term debt. 10) Good companies can generate high rates of return on retained earnings. 11) Using simple school-level maths to value companies is much better than going by how you “feel” about a company, or what your uncle/brother/mate-down-the-pub said. 12) Using an investment checklist is by far the best way to analyse companies because a) it forces you to be consistent in your analysis from one company to the next and b) it gives you a blueprint which you can improve as you make new mistakes and learn new things. I must admit that I love this book, especially the bit at the back where it has a long and detailed checklist of quantitative and qualitative questions to ask when you’re reviewing a company. Today my strategy is substantially different in detail, but the basic goal of using a checklist to look for good companies at low prices is the same. For balance, here’s something I don’t like about the book. I might be wrong, but from memory there’s very little about portfolio management, i.e. position sizing, number of stocks, diversification, that sort of thing. I think portfolio design and management is incredibly important, so this is a bit of an oversight in my opinion, but perhaps Buffett or the author disagrees. Okay, so portfolio design is perhaps a little overlooked in The New Buffettology and that’s where The Intelligent Asset Allocator comes in. I read this book somewhere in the early 2000’s. Back then I was a passive index-tracking investor and – in the depths of the 2003 bear market – I’d just panic-sold out of my FTSE All-Share tracker. I thought there was probably more to this investing lark than just owning a FTSE All-Share tracker (yes, I had all my money in just one tracker), so I bought this book. I wanted to learn about how to build a diverse, low-risk portfolio of multiple indices, covering international stocks, bonds, commodities, real estate and so on. What I basically got was a first class education in risk and return, asset allocation and portfolio design. 13) Asset allocation can have a massive impact on a portfolio’s performance. 14) Risk and return are usually joined at the hip (risk is defined in the book as standard deviation or volatility of annual returns while returns are defined as long-term annualised returns). 15) If you want higher returns you need to be willing to accept higher risks, i.e. more volatile annual returns and a greater risk of loss (although Buffett strongly disagrees with this premise). 17) In general, the longer a risky asset is held, the better the chances of a good outcome (in other words, investing is a long-term game of years and decades, not weeks or months). 18) Dividend yield + dividend growth is a good way to estimate long-term future returns from the stock market. 19) Mixing assets with weakly or negatively correlated returns can reduce risk and increase returns at the same time. 20) Some form of rebalancing is essential because a) it keeps your portfolio’s actual asset allocation in sync with your desired asset allocation, and b) it forces you to be contrarian (i.e. a value investor) by selling the best performing assets (selling high) and buying more of the worst performing assets (buying low). 21) The future cannot be predicted, so an asset allocation should be chosen which will perform reasonably well over a wide range of possible futures. 22) It is possible to value the entire market using price to earnings, book value or dividend yield (although long-term measures like the CAPE ratio are better). 23) Good companies are generally bad stocks, and bad companies are generally good stocks (because good companies are usually expensive and bad companies are usually cheap. However I would say that good companies at low prices are even better). 24) Dynamic asset allocation is a turbo charged version of rebalancing with the aim of increasing returns and reducing risk even further. It works by deliberately allocating more of a portfolio towards whatever has gone down the most and away from what has gone up the most (which sounds a lot like value investing to me). Despite being based almost entirely on the Modern Portfolio Theory and Efficient Market Hypothesis worldview, this book does give an extensive nod to value investing as well. In fact, The Intelligent Asset Allocator may well have been the first place I read about value investing and Ben Graham, and for that I am eternally grateful. This may be my favourite investment book of all because, for some reason or other, I find portfolio design and asset allocation very interesting; much more interesting than picking stocks and analysing companies. But even if you’re a bottom-up stock picker rather than a top-down portfolio builder, I think you’ll still find this book extremely interesting and useful. On the downside, there are quite a lot of equations, charts of various kinds and numbers in general. But this is a book about investing, so a few numbers should not be the end of the world. But still, it’s quite a dense read, but easily worth the effort I think. So The New Buffettology taught me how to analyse companies to see if they’re high quality companies at attractive prices. 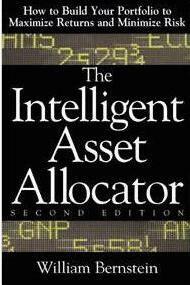 The Intelligent Asset Allocator taught me all about the power of broad diversification and regular rebalancing. 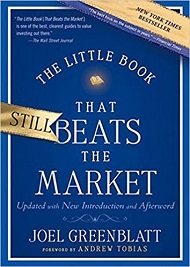 The final book in this list taught me about the importance of focusing on the value-adding traits that some stocks have, rather than on the individual stocks themselves. It also taught me an ingenious and robust way to compare hundreds of stocks against each other in an instant. This is the famous “Magic Formula” book in which (Professor) Joel Greenblatt explains how to pick stocks using a simple quantitative formula. I bought the book because I’d watched some interviews with Greenblatt and what he said made an enormous amount of sense. His message was basically to buy above average companies at below average prices, rebalance once a year and ignore pretty much everything else. 25) Investing is hard, so having a disciplined, methodical, long-term investment strategy that both works and make sense to you is essential. 26) The true value of most listed companies does not swing wildly from high to low, or low to high, despite their share prices doing precisely that. 27) Stock market volatility is driven by emotion or other factors that have little to do with economic realities. 28) Buying stocks at a big discount to fair value is a good idea, but figuring out fair value is very hard because fair value depends on future profits and the future is hard to predict. 29) A stock with a higher earnings yield is better than a stock with a lower earnings yield (all else being equal). 30) A company with a higher return on capital is better than a company with a lower return on capital (all else being equal). 31) A company with high rates of return on capital has the potential to generate high rates of return on reinvested earnings (i.e. earnings not paid out as dividends). 32) Companies with high rates of return on capital usually have some sort of competitive advantage. 33) Buying good companies (with high returns on capital) at low prices (high earnings yields) is a good idea. 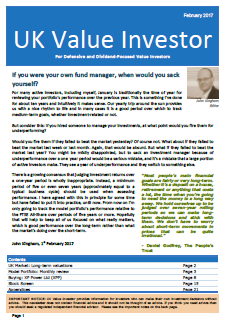 34) Over the long-term it is the average performance of your holdings that matters, not their individual performances. 35) Absolute measures of quality can be excessively restrictive during bull markets (if your minimum standards are a return on capital and earnings yield of more than 15%, there may be no such stocks available). 36) Relative measures of quality work no matter what sort of market we’re in (even in a bull market there are companies with the best combination of return on capital and earnings yield). 37) An excellent way to find companies with the best combination of quality and value is to use ranking. Just rank the whole market by each factor (so the company with the highest return on capital gets a return on capital rank of 1, the next highest gets a 2, and so on) and then add up the factors for each company. The companies with the best (lowest) overall rank are the most attractive. 38) If a good investment strategy worked all the time then everyone would use it and it would stop working (as per the efficient market hypothesis). 39) So counterintuitively, the best strategies will usually have long periods of underperformance, which will shake off all the uncommitted bandwagon chasers and allow for outperformance again. Once the strategy is unpopular it should start working again. There are a lot of great ideas in this book. For me the two most important are 1) focus on the performance and characteristics (growth, yield, etc.) of the portfolio rather than individual stocks, and 2) find attractive stocks by ranking the whole market by each attractive factor in turn, and combining those ranks into a single “super-rank”. The point about ranking stocks is especially important because my stock screen is now largely based on that one idea, and so far it’s worked extremely well. So that’s my list of dessert island investment books, ones I have a special attachment to because they’ve helped me so much. The first one got me into defensive value investing in the first place, the second taught me about diversification and rebalancing and the third one taught me to focus on the portfolio and how to rank stocks. If you have any favourite investment books that have really helped you out, please mention them in the comments below so that other readers can benefit from your experience. I am pretty committed to following the system that you have created, so I quite like your book. I’ve read the three that you mention, but the book I most value is, ‘The most important thing’ by Howard Marks. I’m sure you will have read it. What do you think? But the blog post was getting pretty long anyway, so I had to cut something out, and while I like Marks’s book and learned a lot from it, it didn’t really have a major impact on my strategy, at least directly. Thanks for mentioning it though, it’s definitely a book that all active investors should read. Excellent articles and a good writing style – most enjoyable. Reading this one I noticed, again, that investing is presented as primarily an accounting, or balance sheet exercise (except for the brands comment). My own approach starts from a totally different viewpoint (which doesn’t negate the points here). Why would anybody buy a supermarket or bank? One can stand on a street corner and point at several competing examples. Sure, if your timing is right you can make money, but the risk of getting your timing wrong is not worth it. Why would anybody buy an insurance company – their accounts are indecipherable and there are lots of them? Sure, if your timing is right you can make money, but the risk of getting your timing wrong is not worth it. Why would anybody buy a company that has huge contracts at low margins? The risk of getting it wrong is just not worth it. Grouping like with like and then applying your list I do see as sensible. But, putting together, say HLMA and BP doesn’t seem at all sensible to me. “investing is presented as primarily an accounting, or balance sheet exercise” – That’s just how my brain works I’m afraid. At school my maths ability was way ahead of anything else I did and I tend to gravitate towards that type of thinking. So it’s good to get your more intuitive perspective. Very much with you on the Dynamic Asset Allocation coyly discussed in Bernstein’s book, which builds on work that can be traced back through Graham, etc, to Babson in the 1880’s. Asset Class Allocations through market cycles is so very important, that why anyone would use fixed percentages defies logic. Thanks Magneto. Fixed percentages are just super-easy and fit in with the efficient market idea, which a lot of people go along with. Personally, I use fixed percentages with my son’s JISA out of pure laziness. Or I could argue that my time is more valuable (£/hr) than the additional gains he might get from dynamic asset allocation because his portfolio is so small. Once his portfolio is bigger it might be worth doing. My favourite: The Big Secret for the Small Investor by Joel Greenblatt. Joel Greenblatt: I wrote another book it begins, it’s called The Big Secret. And it’s still a secret I say cause nobody bought it. So I’ll just tell you what the secret is. Consuelo Mack: Yes, please do. Joel Greenblatt: The secret is really patience is in really short supply. I give a few examples in that book, one of them is really telling. Hi Gregory, I like pretty much all the books written by Greenblatt. He certainly has a talent for getting complicated ideas across in a simple manner. His big idea at the moment is to try to build a fund that outperforms, but that also tracks the market quite closely. The idea is that investors tend to jump ship when their funds underperform the market, even if the fund is very likely to outperform over the long-term. So he wants to build something that outperforms the market, but never underperforms it by much so that the fund’s individual investors don’t bail out at the wrong time. And that’s pretty much the goal of my investment strategy as well. John, Interesting article, I have a few comments below, however, on book selection, I still think “Intelligent Investor” by Benjamin Graham is the best. I also liked the Zulu Principle by the late Jim Slater, although some of it’s valuations miss some important factors. >>> Wrong, lower risk companies consistently provide the better long term returns and high risk increases your exposure to loss of capital. 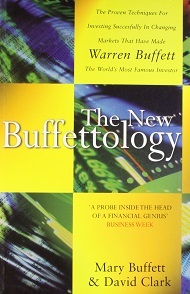 >>> I agree with Buffetology, it’s not correct and is almost the same mistaken assumption as set out in item 14. >>> This is correct, but often volaitlity has no bearing on the long term value of an investment. >>> The complete reverse is true — the longer you expose your money to risk, the more chance you have of losing it period — it can not be disputed. >>> This is a myth — the payout of dividends doesn;’t always relate to company performance, as professional (or not depending on how you view them) can pump prime debt and fudge accounts to make it look like the company is growing when it isn’t. Return on investment is the only measure of success. >>> Sounds like a completely meaningless statement and follows from the 14-17 in being misguided in it’s assumption. >>> Often a blind mantra for selling parts of your holding in good companies and investing the proceeds in less successful one puerly to satisfy a mental need. >>>> Has to rank as one of the stupidest statements ever written in an investment book. You should never invest in a bad company – period. Hi LR, on The Intelligent Investor, it is one of my favourite and books and it was the first book that really got me into value investing. The main reason I didn’t mention it is that almost all value investing book lists include it, so I wanted to focus on some other books that were equally important to me. I agree with most of your points in the case of individual stocks or small subsets of the market, i.e. risk (defined as volatility) and return (defined as long-term annualised return) are not always closely related, and sometimes lower risk stocks generate higher long-term returns (Unilever being a standard example). However, the author is referring to risk and return of entire asset classes, or major subsets of those classes, so stocks, bonds, small cap stocks, foreign stocks, REITS, etc. In those cases there is lots of data which says that historically, risk and return are fairly closely correlated so that higher long-term returns are generated by higher risk asset classes. This is based on data, not assumptions, so historically, stocks have returned more than bonds, risky (volatile) small caps more than less risky (less volatile) large caps, bonds more than cash, and so on. But as you say, there are subsets of the market, such as “bond proxies”, which have historically not followed this generalisation, and of course many individual companies don’t follow it either. But at the highest level of stocks, bonds, REITS, etc. it has been true. As for the good (bad) companies are bad (good) stocks, that’s also true at the highest level. In fact, Ben Graham’s net-net deep value strategy was based on that exact idea. He would own hundreds of stocks purchased for less than the scrap value of their assets, so these were definitely “bad” companies making little or no profit. But because these companies could be bought for less than their replacement value, somebody somewhere would take action and either liquidate the assets, therefore realising Graham and other investors a profit, or turn the company around, which would drive up the share price. Have a read of the Deep Value book by Tobias Carlisle for more info on this, and the data backs it up. Having said that, while bad companies may make good investments, you have to be able to diversify massively, and there are other issues such as bid/ask spreads, because these companies are often very small. I also found deep value investing a very miserable way to make money as you’re basically investing in rubbish companies the whole time. It isn’t exactly inspiring. Personally I think that few private investors will be willing or able to hold the large numbers of stocks required to make a bad company (i.e. deep value) strategy work, hence my own personal switch to quality/defensive value in 2011. “18) Dividend yield + dividend growth is a good way to estimate long-term future returns from the stock market. These are good points, esp escalating debt to pay dividends must be scrutinised. ROCE is indeed a useful tool to help with individual stocks and markets, throwing up anomalies, and seem to recall is embedded with other measures in JK’s analysis..
is the so-called ‘Gordon Equation’, a simplified rendering of the Discounted Dividend Model (the present value of its future income stream), a traditional means for estimating future returns for stocks, and hence in turn a reasonable price. Has some venerable history, but as observed might need care in its application. John — Off topic a little — ever had your spyglass look over the AA? No, I haven’t ever looked at the AA closely. It’s only been listed since 2012 following the earlier period of ownership by Centrica, private equity firms and a management buy-in, so it doesn’t have the 10yr public track record that I look for. I attended boarding school in England and medical school in Germany. Then l emigrated to the USA, where l specialized in general pediatrics in which l worked for 7 years. Then I sub-specialized in neo-natology (newborn medicine) in which l worked for 26 years after which l retired. I AM SEEKING a book on investing written by a British (from England) author because l understand British teachers best. PLEASE, can you tell me about an investing book written by an author from England? 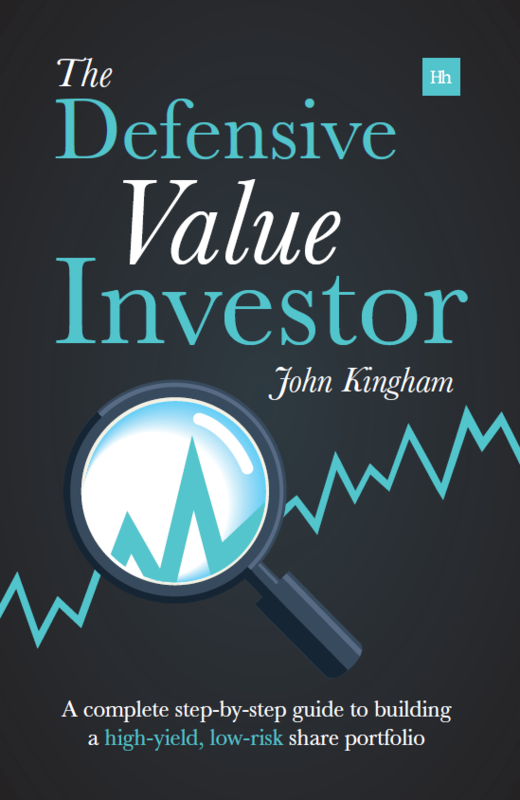 For active investing in shares, I would humbly suggest my book, The Defensive Value Investor. Or for passive investing, Tim Hale’s Smarter Investing.